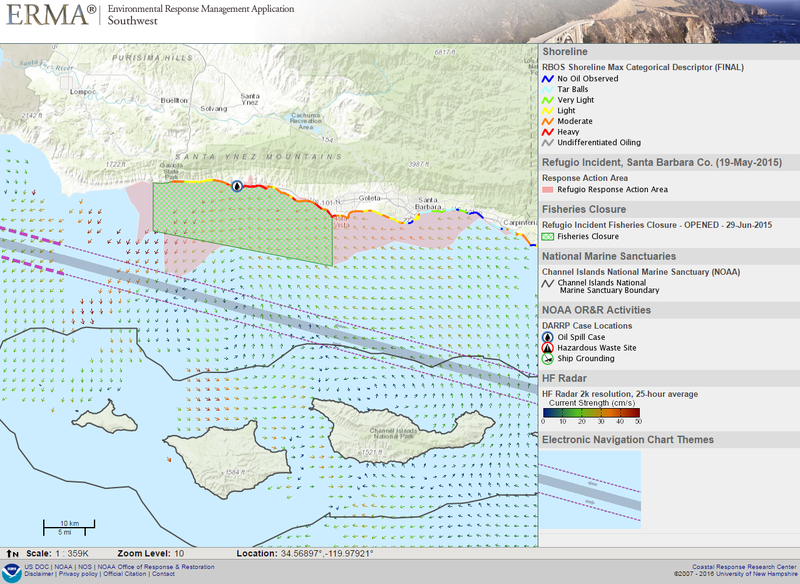 Southwest ERMA is an online mapping tool for the coastal California region that brings a variety of data together into a single interactive mapping application. ERMA allows quick visualization of environmental conditions and improves communication and coordination for emergency response, response planning, and restoration efforts. Datasets include habitats and natural resources at risk, Area Contingency Plans (proactive plans for dealing with oil spills and environmental disasters), and real-time weather and operational data. From the earliest days following the Refugio State Beach Oil Spill near Santa Barbara, California, ERMA provided information and visualization tools for spill responders, while serving as a central tool for NOAA and other natural resource trustees conducting the Natural Resource Damage Assessment (NRDA). Southwest ERMA enables emergency responders and NRDA scientists to work more efficiently, providing access to the most up-to-date information and analyses. In addition to real-time response information, Southwest ERMA provides valuable spill response planning information. The Area Contingency Plans (ACP) developed by regional response teams are publicly available in digital format on Southwest ERMA. These include links to protection strategies for sensitive locations. The spatial data is updated by the State of California Office of Spill Prevention and Response (OSPR). ERMA is also used by the U.S. Coast Guard to map derelict and abandoned vessel inventories and identify which vessels are candidates for action and removal. The Southwest ERMA team works closely with federal and state agencies to keep data up-to date. Partners include the California Department of Fish and Wildlife Oil Spill Prevention Office, U.S. Fish and Wildlife Service, and U.S. Coast Guard. ERMA was developed in collaboration with the University of New Hampshire's Coastal Response Research Center. Beginning on May 19th, 2015, Southwest ERMA was used to support both the response and NRDA phases of the Refugio Beach Oil Spill. Here, ERMA shows incident information collected during the response that includes maximum observed shoreline oiling, fishery closures, and the Response Action Area.